Tyler and Cameron Winklevoss competed in the Beijing Olympics. The two Americans who were awarded millions of dollars after claiming they had come up with the idea for Facebook say their legal battle isn't over. Cameron and Tyler Winklevoss studied at Harvard University alongside Facebook founder Mark Zuckerberg, where they started a site called ConnectU. In 2008 a protracted legal battle between the two sides ended with the payment of an undisclosed sum. Facebook said that that it now considers "the matter concluded". 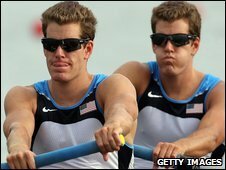 The Winklevoss twins spoke to the BBC on the eve of the Boat Race, in which they will both row for Oxford. Cameron Winklevoss refused to confirm the extent of the 2008 settlement - thought to be $65m - but said: "I think it is safe to say the chapter is not closed on the matter." His brother Tyler said: "It's our duty to stand for principles. We're willing to wait around and make sure that's what right has been made right." The two brothers started work on ConnectU in 2003. They thought that computer science student Mark Zuckerberg was working with them, until he launched a similar site called thefacebook.com. Mr Zuckerberg's site became hugely popular on the Harvard campus and then, under the name Facebook, turned into a global success. "It was really just a sense of shock," said Tyler Winklevoss. "It turned into how can we right this wrong." The settlement of the battle between Facebook and ConnectU involved the award of Facebook shares to the Winklevoss twins. The continuing dispute appears to centre on the value of those shares in a company which has not been publicly floated. "The settlement has been enforced by the courts and attempts to delay that decision have been denied twice. "We hope that discussion of spurious and false allegations and other matters that were concluded years ago are not distracting anyone from their preparations for the race. We consider the matter concluded." The brothers also revealed that after years of avoiding the social network they themselves have joined Facebook. "We weren't on it for a long period of time," said Cameron Winklevoss. "But it's a utility and we're deserving to take part in that. It's a great way to keep in touch with people back home."